The International Women’s Day was celebrated by the various programs of CCDT. Various activities were held to aware the community people about the importance of this day. Fun filled activities included games designed to highlight the role and the potential of women through the medium of sport were also held. The term “Women Empowerment” refers to empowering women with education, employment, decision making, and better health in view of an equal and just society. It celebrates the strides that women and girls have taken in terms of gender equality, educational opportunities, financial independence and confidence. The transformational journey of inspirational women who demonstrated this spirit such as Savitribai Phule, Kalpana Chawla, Mother Teressa, Sindhutai Sapkal, Rani Laxmi bai to list a few were shared. 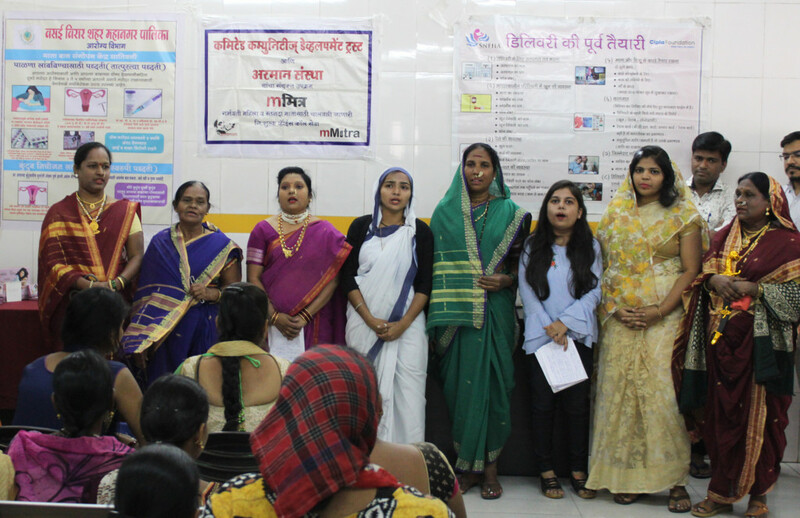 mMitra team dressed as these women leaders shared their life journey and challenges at Mata Bal Sangopan Kendra, Vasai. There are many incidents in a woman’s personal and professional life, where her abilities are undermined against that of a man’s; having an adverse effect on her overall personality and hampering her growth. To spread light upon this issue, Sahyog team planned a session in all the padas (hamlets) of Sanjay Gandhi National Park and Aarey Colony, Goregaon to let women know the importance of being empowered. The team shared an inspirational journey of our leading ladies so that women get inspired and become confident. The session also included games and along with this, emphasis was also laid on skills of leadership, self-esteem, teamwork and communication, which play an important role in empowering women by helping them, become confident individuals and overcome social challenges. It is truly said that it would be a fallacy to dream about the goals of sustainable development and gender equality. There is an instant need to take measures to lift the social, personal and professional status of women, bringing them shoulder to shoulder with men. The session ended with a message to empower women to lead their path to carve out a better tomorrow for themselves and society.